Listen to those AudioBooks Faster! You're not just an audiobook fan, you're an even more impressive class - a self improvement audiobook fan! You've got a long commute, and you take advantage of every second by listening to books about business methods, negotiations strategy, personal self-actualization, all of that. In fact, you wish your commute was even longer, so you could have more time to listen to your books! Well, you can't add minutes to your day, but you can speed up your audio files to get through them faster using MP3 Speed Changer. Think this means transforming your instructional guides into chipmunk music? Wrong! MP3 Speed Changer is able to speed up the tempo of your audio file without changing the pitch! In fact, if you change the tempo to 150%, you'll be able to shave a full 20 minutes off of each hour of audio material. 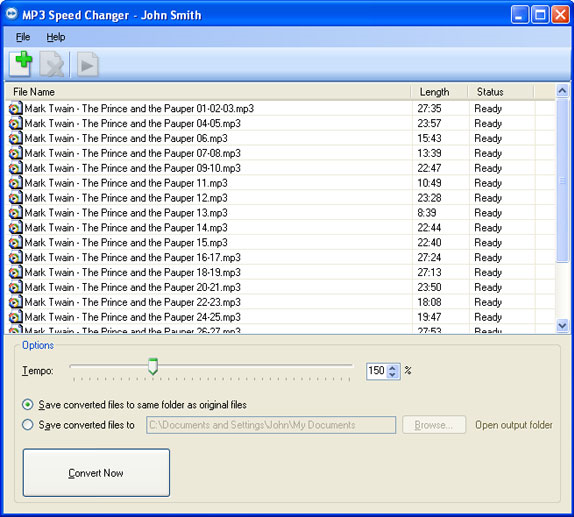 Using MP3 Speed Changer is as easy as dragging and dropping files from Windows Explorer. The program supports a wide range of audio file formats like MP3, WMA, and OGG, and can even extract the audio track from a video file. With full support for batch processing, just drop a bunch of files into MP3 Speed Changer to have them automatically converted to MP3 format and sped up to your selected tempo! Learn faster! Speed up your audio files without changing their pitch. Reducing the listening time of an hour's worth of audio by as much as 20 minutes. Convert MP3, WMA, and OGG files to MP3. Extract audio from a video file, then speed it up. After you purchase MP3 Speed Changer it may be used indefinitely. MP3 Speed Changer is licensed per user, so if more people are going to use MP3 Speed Changer you will need to purchase additional copies. Each license allows installation on all owned computers, but MP3 Speed Changer may not be used at exactly the same time on each of them. Your Complete Audio Editing Solution!